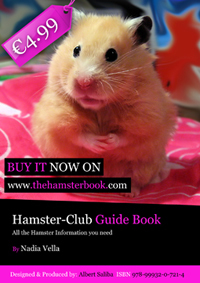 Nadia Vella is one of the founding members of Hamster Club Malta. 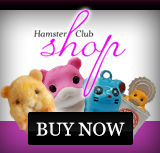 Nadia Vella has a vast experience on hamsters; having adopted hamsters for several years made her aware that there should be more information and exposure to these cute small pets. Nadia Vella won several awards amongst which the award as an Expert Author for writing hamster articles and she is also a hamster expert at allexperts.com. Nadia Vella believes in natural remedies which can help a sick hamster feel better. The hamster's health section was supplied by Nadia Vella which offers lots of natural remedies that can be used by hamster owners if a vet is not available. Some vets may not know specifically how to make hamsters feel better since most vets in most small countries do not specialise on hamsters! That is why Nadia Vella believes that natural hamster remedies are very important to safeguard the hamster's life; even though a hamster is small in size, it does not mean that it should not be given importance, love and cure. 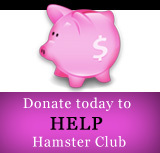 Natural remedies will help a sick hamster feel better if a vet is not available. Nadia Vella also wrote various articles in different local newspapers and magazines amongst which 'The Sunday Times', 'Times of Malta; Junior News', 'The Malta Independent; Crackers Magazine' (various articles), 'The Malta Independent on Sunday', 'The Malta Independent', 'Phase Magazine','Taghna t-Tfal Magazine', 'Vida Magazine', 'L-Orizzont', and 'Il-Mument'. Feel free to e-mail Nadia Vella here.